To read others post about Diabetes Social Media Day, click HERE. 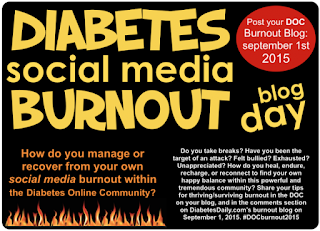 Diabetes Social Media Burnout -we�ve all experienced it more than once - and that�s OK.
Today is actually Diabetes Social Media Blog Day, aka, #DOCburnout2015 - and it couldn't come at a better time! The DOC is amazing and at times, a very overwhelming place to call home. So many people, so many opinions, feelings, thoughts and issues - sometimes, at least for me - sensory overload kicks in. Recently, (as in the last month) I've found myself suffering from burned out re: all things diabetes related online. I would sit and stare at my computer blankly -trying to write blog posts - then deleting whatever fragmented thoughts that I�d been able to piece together. This happens to me every now and then and acknowledging the feeling really helps me. Diabetes is 24X7 for most of us - we live with it, we write, tweet, Instagram, vine, youtube, periscope and spend an inordinate amount of time, both online and off, discussing diabetes - and there are times when it all becomes too much and my/our energy gets zapped and I feel trapped by the interwebz - see below. Too much time online can make me feel trapped and more than a little bonkers. Ironically, diabetes has been known to make me feel the same exact, every now and then. FYI:I took this photo at the Franklin Insititute's Lego Exhibit - it was awesome! And I've found that whenever the Diabetes Social Media burnout feeling becomes overwhelming, I need to step back from my life online for a few days/weeks and regroup, reassess, and recharge my life offline - and that taking a step back is more than OK - It's necessary. So yes, the month of August has been sparsely populated on diabetesaliciousness. I�ve participated in #dsma (because #dsma always makes me feel better,) and on Facebook discussions - but I've spent far more time focusing on things offline. Giving myself permission few a weeks at the end of the summer (or anytime you feel completely burned out via diabetes and or diabetes social media,) is wonderful thing. Giving myself permission to walk away from the blog and not worry about the content - FTR, I�d rather have quality content instead of quantity, is just want this chick with a busted pancreas needed. So if you�re feeling overwhelmed and burned out by Diabetes Social Media - that�s OK, you�re not alone. Take a step back, take some time to breathe and enjoy your surroundings. Take a few beats to regroup and come to the world of Diabetes Social Media with your passion reignited your batteries recharged. 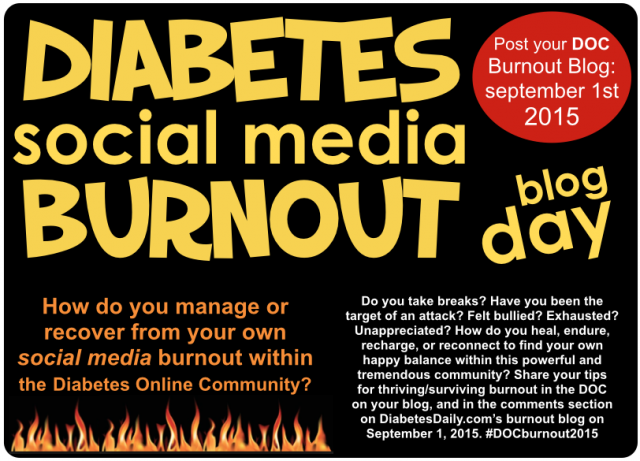 Thanks to Diabetes Daily for creating this day and encouraging all of us to share our feelings on #DOCburnout2015!